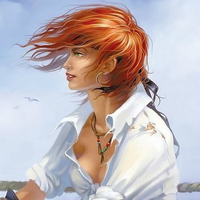 Bellena walked along the deck checking the condition of the planks and railing an additional time before her shift on the helm was to start for the evening. She saw a row boat from one of the other ships headed her way. When it got close enough she recognized the small Miya princess she had met back in Dragon's Guard being rowed along by a crew member. She walked over and lowered a rope ladder to the woman as they drew near the side of the Kunshu Maru. Bellena helped the woman climb up onto the deck and then nodded a greeting. "Miya-sama, it's a pleasure to see you. To what do we owe the honor?" Suihime was glad for the quick ropeladder. She wasn't the fastest climber, so it took hee longer than most to scale the ladder. She gave the woman a smile and a bow once she was up. "Good to see you also Muhaki-san. I hope you are well? I hope my unexpected arrival has not disrupted you from your duties, I just wished to see how the voyage was affecting the other ships. How have you found it so far?" She nodded, "It's been relatively smooth so far for us... not without excitement now and again. Would you like to come in and sit down in my quarters?" "It has been quite an interesting journey so far. Those who haven't travelled long journeys are learning what it is like to be out at sea, and we still have much of the voyage to go. I've found it a good experience. If it is no intrusion, I would be happy to join you at your quarters" Suihime nodded with a smile. Bellena led her into her quarters and prepared a seat for the woman. "So is there something I can help you with today Miya-sama? Perhaps come for a chat about things to come?" Suihime allowed herself a moment upon entering to look at the quarters before speaking. "I do have a few curiosities, but the main one is seeing you here at all. I didn't think you were joining the Imperial Explorers, yet here you are on the voyage. What made you change your mind?" She nodded, "I am due to return to my superiors out at sea, but my boat befell a bit of misfortune. 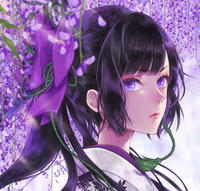 And I was approached by Asahina Yajinden before the examinations for those who wished to be officers on the voyage... seeing there was a dearth of experienced sailors he asked me to participate and reassured me we would be travelling to the place I was intending to go." "A rather fortunate turn of events then" Suihime nodded "your vast knowledge is certainly welcome here. This is the furthest I have sailed out, and very much the largest ship I have captained. A lot of expectation of those placed in charge, but I remain confident in those chosen." "I truly hope their inexperience doesn't come back to bite them or their crews in the days ahead." She replied with a nod. "I'm sure it won't; they are samurai after all" Suihime shook her head "they will do their duties. " She smiled, "If samurai always did their duties I'm sure there would be no problems in the empire... the problem my young friend is that there are few who are so perfect. And there are things here on the ocean that are beyond their capacity to deal with even if they do their best to fulfill their duties."